Folks, your Miami Heat are just one 48-minute game away from clenching their first championship of the LeBron Era. Yep, in game five tonight, there's a chance the NBA Championship could come back to Miami, but there's an even better chance that you're not one of the 19,600 lucky souls who will get to watch it all go down in person at the American Airlines Arena. If so, RSVP to Haven's game five viewing party ASAP. 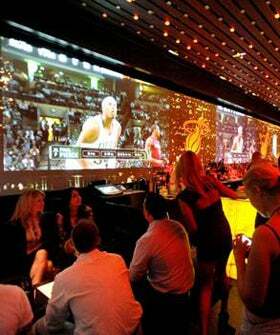 In addition to playing the game on their massive screens, the local club fave will be serving up a properly themed menu of spicy, spicy treats including neu-cuisine hot wings, Mexican "hot" chocolate liquid-nitrogen-cooled ice cream, and the equally scorching Fever (a Grey Goose martini with jalapeño, lychee, and prosecco). And, cross your fingers, because if the Heat win tonight, chef Todd Erickson will be celebrating with one hour of free Citrus Infernos (a flaming mixing of Stoli Hot vodka and Mandarin Napoleon). It's enough to make you root for the home team even if you don't care about basketball. When: Tonight, Thursday, June 21, starting at 9 p.m.
Where: Haven Lounge, 1237, Lincoln Road, Miami Beach, 305-987-8885.